Geneva, with its exceptional lakeside setting and views of Europe’s highest mountain, Mont Blanc, is a magnificent city. It is proud of its quality of life and fabulous Jet d’Eau, the iconic water fountain. Considering its international standing and reputation as capital of peace, it is surprisingly small. Geneva’s excellent infrastructure distinguishes it as a world hub of major symposia and conferences. Hence, here’s to your success, The First Geneva International Women Entrepreneurs’ Forum (GIWEF) – Premier Forum International des Femmes Entrepreneurs à Genève (FIFEGe). The President of the GIWEF-FIFEGe Executive Committee is Ms. Ingrid I. Vanore-Speer. She is fluent in German, English, French, Spanish and Italian she has private sector experience as an export manager in several major private enterprises. She is a graduate of the Vienna University of Economics and Business Administration and holds diplomas from selected other European Universities and Management Institutes. She gained extensive international experience in trade development in developing countries, particularly in Africa, and transitional economies, when she held senior positions in the International Trade Centre-UNCTAD/WTO. The First Geneva International Women Entrepreneurs’ Forum (GIWEF) – Premier Forum International des Femmes Entrepreneurs à Genève (FIFEGe), will be organized in Geneva on 4-5 July 2013, by the GIWEF-FIFEGe Association, under the auspices of the World Association of Women Entrepreneurs (FCEM). The Forum will benefit from the support and cooperation of various Swiss and international organizations, as well as from policy, business and financial sector sponsors. Please note that with a view to facilitating access to the GIWEF-FIFEGe Conference we have changed the venue to the Hotel InterContinental Geneva, 7-9, chemin du Petit-Saconnex, CH-1209 Genève. The Forum will debate crucial questions of sustainable development impacting on women, which will set the basis for the elaboration of efficient strategies by enterprises, financial institutions and international organizations; and facilitate public-private-partnerships (PPP) for the development of enterprises and investments by and for the women worldwide. The Forum will take an integrated and holistic approach to economic development that must be socially and culturally responsible, and environment-friendly, thus engaging in a multifaceted and dynamic process, and aiming to review the sustainable development topics that are being debated in the UN and multilateral circles, and among the international civil society organizations. With such approach, participating women entrepreneurs from developing and emerging countries will benefit from possible bridging among all players. Thus, representatives from the business and financial sectors will be associated with the Forum as potential partners, investors and donors. 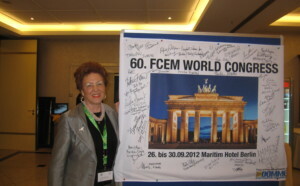 The subject of the 2013 Forum will be “Women Entrepreneurs as the Engine for Sustainable Growth”, with the main theme featuring “Finance and Sustainable Development for Women Entrepreneurs” and subjects related to the future of international trade, etc. Improve the access of women entrepreneurs’ innovative projects to appropriate financing, to help them contribute more efficiently to creating new sustainable jobs in the sectors of trade, agriculture, industry, crafts and services, which would have positive economic, social and political implications. With a view to facilitating the organisation of an International Women Entrepreneurs’ Forum on an annual basis, the new Association “Geneva International Women Entrepreneurs’ Forum (GIWEF) – Forum International des Femmes Entrepreneurs à Genève (FIFEGe)” was created and registered in Switzerland in the Register of Commerce under number 4692 / CH-660.0.113.013-8/07113536. The President of the GIWEF-FIFEGe Executive Committee is Ms. Ingrid I. Vanore-Speer and its Vice-President Ms. Dominique Chausse. GIWEF-FIFEGe Association Seat: 5, Chemin Malombré, CH-1206 Genève.